Research shows that 95% of Americans will suffer from some form of tooth decay by the time they turn 65. The main reason for this? Poor dental hygiene. In 2019, electric toothbrushes are better than ever… With record levels of dental decay, now has never been a more important time to update your toothbrush and make those teeth sparkle again. If you’re looking to update your old toothbrush this year, then you’ve come to the right place. I’ve gone through a ton of electric toothbrushes to make sure that the 10 that I recommend are the best of the best. Ranging from premium to budget oriented, from bells and whistles to bare bones basic. 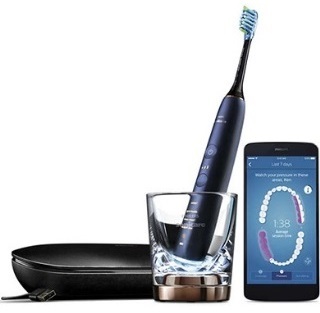 Toothbrush-tech in 2019 is better than it has ever been, it’s never been easier to maintain a perfect set of pearly white teeth. So let’s take a look at the top 10 electric toothbrushes on offer this year. Do you really need to switch from a manual to an electric toothbrush? 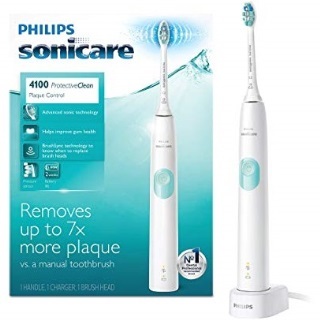 The Philips Sonicare DiamondClean is perhaps the most premium electric toothbrush Philips has on offer. The Philips Sonicare Diamond comes with 4 different brush heads; with each variant having 2 pieces included in the kit. These are all specialized brush heads designed with a specific brushing routine in mind. The Premium Plaque Control brush head is best used for reaching those hard-to-reach areas. The Premium Gum Care brush head is best for those with sensitive gums as it lessens gum inflammation. The Premium White removes stains the best, giving your teeth a whiter sheen. These brush heads also have a microchip inserted in them, so that it can tell the body the exact kind of intensity it needs to be fully effective. There’s no need to choose a mode as all you have to do is put on your preferred brush head and you’re good to go. 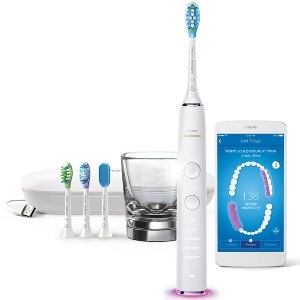 It also comes with a companion app, which when used with the Philips Sonicare DiamondClean, ensures that you are brushing the right way every time. The app will show you which areas you may have missed and will also flash if you’re applying too much pressure on your gums. You can also order additional brush heads from the app, making sure that your toothbrush is in the best state possible. The included carrying case is classy and also doubles as its charging base. It also has an elegant glass charger which can double as a rinsing glass. 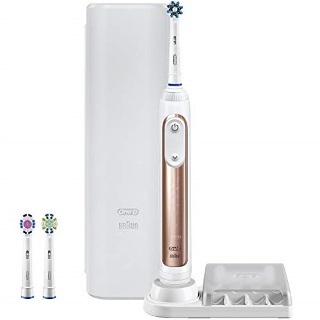 Packed with tons extra features, this toothbrush has just about everything you’ll need, perhaps that’s one of the reasons why it’s so consistently reviewed as the top rated electric toothbrush on the market. With the Philips Sonicare Diamond, I don’t have to worry about missing a spot on my mouth or having to buy a separate tongue scraper to keep my tongue clean. I also particularly loved the Sonicare app, it’s packed with all the information you need to start learning how to take better care of your teeth. Also, using Amazon Dash integration, I don’t have to worry about remembering to buy new brush heads. I can set it up so that I receive a new set of brush heads every other month. This app also features an innovative method to help you set goals, which will help you in making sure that your following your dentist’s advice to the letter! Of course, because this electric toothbrush has just about every extra feature you could ask for, it comes at a very steep price. When you compare it to other electric toothbrushes in the market, you might think that it’s not worth the asking price. But do consider that Philips is offering the best of the best here. This is a premium product, once you buy this toothbrush, you probably won’t need to buy another for a very long time. The CrossAction brush head. It has bristles angled at 16 degrees and cleans up to 500% more plaque than a manual toothbrush. Besides the CrossAction brush head, the package also comes with a 3D White brush head and a Sensitive brush head. The 7000 series boasts of 6 different brushing modes designed to tackle different needs for your teeth. Daily Clean is the go-to setting for everyday brushing. Deep Clean is for those times where you need to clean those harder to reach areas in your mouth. Gum Care gives your gums a lovely massage to promote gum health. Sensitive is for those with sensitive gums and teeth who are unable to use the other options as they may cause inflammation or bleeding. White Cleaning, when paired with the 3D White brush head, is focused on whitening your teeth. Finally, Tongue Cleaning helps scrape off leftovers on your tongue that can cause bad breath. The Oral-B 7000 also comes with pressure sensitive technology. The toothbrush will actually light up if it detects that you’re applying too much pressure on your teeth and gums. The included charger also doubles as a stand and dock for your toothbrush. The first thing I’d want to mention is how flexible this toothbrush is. It’s perfect for those with sensitive teeth as the sensitive brush head and a sensitive vibration setting helps avoid overbrushing. The included CrossAction brush head is really effective in removing even the hardest of stuck morsels in your mouth. It also comes with a handy 2-minute timer, which should help you in making sure that you’re brushing for at least 2 minutes, which the ADA recommends you do twice a day. It also comes with a handy app for your smartphone which can assist you in attaining your oral health goals. When you pair your phone and your electric toothbrush via Bluetooth, you can get real-time feedback on how you brush your teeth so you can make adjustments accordingly. There have been some reviews that say that the battery tends to lose its charge just after a few months in. There are also rare cases of it being not completely waterproof, some report that after using it for 6 months the toothbrush actually stopped working due to excessive rust. While most electric toothbrushes rely on various brush heads, vibration settings, and smartphone integration via Bluetooth, The Waterpik Complete Care Water Flosser and Sonic Toothbrush presents a different, approach. Instead of relying too much on new technologies, it stands out from the rest of the products by going back to the advice dentists always give: Brush and floss your teeth twice a day. 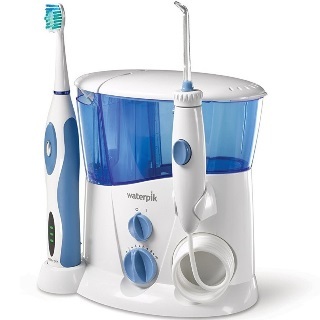 Waterpik stands out because it bundles the included Sensonic Professional Plus Toothbrush with a water flosser. These are similar products used by dentists when they clean your teeth! Also known as oral irrigators, these devices use a steady, pressurized stream of water to remove clingy plaque and tartar from your teeth and gums. The WP-900 comes with 4 different tips for its water flosser. The Classic Jet Tip is great for everyday use. The Plaque Seeker Tip is recommended for those with implants and crowns to remove plaque from hard-to-reach places. The Orthodontic tip is perfect for those with braces as it can clean the area around the braces. The Pik Pocket Tip is used for those who need to deliver medicaments below the gumline and is also much less intense making it perfect for those with sensitive gums. As for the toothbrush itself, it has 2 built-in speeds, a built-in timer which reminds you to brush for at least 2 minutes, and a charge indicator. People usually forget that, besides brushing your teeth, you also need to floss in between your teeth to make sure that all the tartar and plaque is washed away. While most electric toothbrushes on the market state that their brush heads can remove these hard-to-reach areas, a good old-fashioned oral irrigator is guaranteed to do the job. If you’re one of those people that can’t seem to find a toothbrush that can reach those very deep places, I recommend that you give an oral irrigator like this a try. Not only will it fully cleanse your mouth, but you’ll amaze your dentist with your newly found dental hygiene. Another thing I like about the Waterpik Complete Care Water Flosser and Sonic Toothbrush is its simplicity. It doesn’t have any fancy Bluetooth integration or any “revolutionary” brush head designed to do everything at once. It goes back to the basics and gives you a device that assists you in those basics. For some people (especially those who don’t want to deal with too much technological integration) this is perfect for their needs. While the Waterpik oral irrigator is great and all, the included toothbrush might be lackluster. Other companies offer electric toothbrushes with much more brush heads and functions as compared to the one included here. The battery life, according to some reviewers, is also prone to degrading fast if you charge it every day. The best solution, in my opinion, is to get a separate electric toothbrush and pair it with the oral irrigator here. The Oral-B Genius Pro 8000 is the next step in Oral-B’s electric toothbrush line. As with the Oral-B 7000 Smart Series (which I reviewed earlier), this electric toothbrush is also made in collaboration with Braun. It carries over the same 6 settings from the 7000 Smart Series (Daily Clean, Sensitive, Gum Care, Deep Clean, Tongue Cleaner and Whitening). So, if you’re familiar with using them, you’ll have no problems picking up where you left off with the 7000. Of course, the Genius Pro 8000 has some major differences compared to the 7000 series. It supports an additional kind of brush head: the Power Tip. And its traveling case charges not only charge your electric toothbrush but also your phone as well. The battery also lasts a lot longer, with the Genius Pro 8000 being able to hold 14 days of charge compared to the 7000 Smart Series’ 10 days.. The biggest difference is that the Genius Pro 8000 has ‘Positional Direction’. Simply pair your electric toothbrush with your phone, put your phone on the included mount, and brush away. Using innovative technology your smartphone will actually alert you if you’ve missed an area. Using this feature you can be certain that you’re brushing your whole mouth thoroughly, for that dentist-clean feeling everytime. 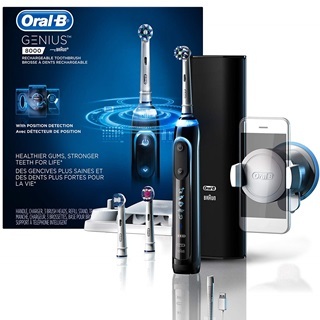 The Oral-B Genius Pro 8000 is a direct upgrade from the Oral-B 7000 Smart Series. If you’ve read my previous review above, you already know how much I praise these Oral-B toothbrushes for their sheer versatility. But the advantage of the Genius Pro 8000 is in its Positional Direction system. While the 7000 Smart Series does track the areas you’ve already brushed, the Genius Pro 8000 takes it to a whole other level. It can now see your actual brushing which helps it give more accurate recommendations on how to better brush your teeth. I wholeheartedly recommend this electric toothbrush to those who want to know for sure that they are thoroughly brushing their teeth and getting every nook and cranny. However, there are some reports that state that this function doesn’t work as intended. Most reviews say that the feature works perfectly, but if you have an old smartphone with an older camera you might not be able to use this toothbrush to its fullest extent. While I stated that the previously reviewed Philips Sonicare DiamondClean was perhaps one of the most premium electric toothbrushes on the market, the price might make a few customers flinch. 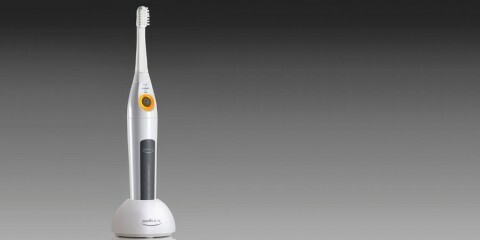 Luckily, Philips also provides other options for the more budget-conscious buyer such as the Philips Sonicare FlexCare+. The Philips Sonicare Flexcare+ caries the same motor from the DiamondClean, which is able to deliver 31,000 strokes per minute. This ensures that the teeth are thoroughly cleaned during brushing, removing almost all of the plaque near the gums and between the teeth. As for its other features, it has five different brushing modes to choose from: Clean is for everyday usage, Gum Care gently massages your gums after brushing, Refresh allows you to clean small spots quickly, Sensitive is for those who need a little less pressure, and Massage is for promoting gum health. It also has replaceable heads which allow it to be customized for a person’s brushing needs. It also boasts a 3-week battery life which makes it perfect for those who are always on the road. The Philips Sonicare FlexCare+ almost has everything I liked from the DiamondClean in a more budget-friendly package. Because it uses the same motor from its more expensive counterpart, you can be sure that you’re gonna get a very similar brushing experience. It also has replaceable and interchangeable brush heads for those who may be interested in other types of brush heads. Another big upside is the long battery life. Compared to other electric toothbrushes in the market that last anywhere from 7-12 days, the Philips Sonicare Flexcare+ lasts up to 3 weeks. While some may say that recharging is a minor annoyance, with the Flexcare+ you almost never have to worry about it. If there’s one thing you have to be cautious about with this product it’s that some people have reported that their Philips Sonicare Flexcare+ fails after around 9 months of usage. Just make sure to register the warranty for it and you should be fine. Another entry into this list from Oral-B is the Pro 7500. Once again, this model is made in collaboration with Braun. 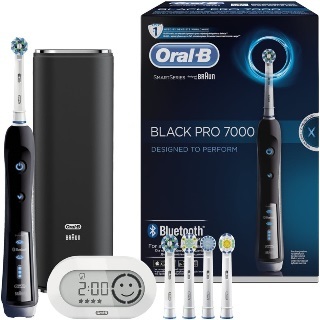 As its number says, the Pro 7500 sits somewhere between its fellow Oral-B products, the 7000 SmartSeries and the 8000 Genius (both of which I reviewed earlier). It comes with the usual Oral-B features which you should be familiar by now. An interchangeable brush head to allow you to customize to your needs. A customizable SmartRing which alerts you if you’re applying too much pressure on your teeth. And a Smartphone integration system via Bluetooth which allows you to track your habits through the free Oral-B app. It also boasts 5 different brushing modes, which when used with the interchangeable brush heads, gives a wide array of cleaning options for your teeth, gums, and tongue, combined with a handy in-handle timer that pulses every 30 seconds to remind you to switch to another area in your mouth. While it doesn’t have the LCD timer included in the 7000 SmartSeries, it has a better battery life to make up for it (14 days between charging compared to the 10 days of the SmartSeries). It also comes in 4 different colors, which adds a nice touch of personalization. Sitting between the 7000 SmartSeries and the 8000 Genius, the Pro 7500 truly is the safe middle ground between the two. Although it might not offer the Position Detection feature that the 8000 Genius has, it carries with it its other high-end features like the customizable SmartRing. I also love the fact that it comes in 4 distinct colors. Usually, electric toothbrushes come in a boring Black or White. The Pro 7500 comes in exciting colors like Orchid and Rose Gold. I personally like this approach and hope that other electric toothbrushes would offer a little more personalization. Some reviewers have stated that it starts to rust as early as a month in. This should be a minor issue so long as you wipe your toothbrush dry after using it. Even though these toothbrushes are made to be as waterproof as possible, wiping it after use will ensure that it’ll have a longer lifespan. 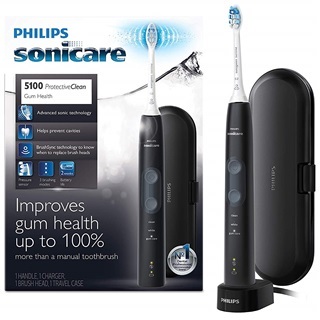 Another electric toothbrush from Philips Sonicare’s line, the ProtectiveClean 5100 is another value-oriented toothbrush. Like the other Sonicare products, the ProtectiveClean 5100 also has classic Philips motor which delivers 31,000 strokes per minute. It comes with 3 distinct modes: Clean is the default setting for everyday brushing, White is for removing stains on your teeth to make them whiter and shinier, and Gum Care which adds in a minute of gentler brushing which is used to massage your gum line. It also has a pressure sensor which alerts you if you’re applying too much pressure to the teeth or gums. The QuadPacer and Smartimer features are present in this model as well, they tell you if you’ve been brushing for the dentist recommended amount of time. One of its standout features is the BrushSync reminder, which lights up a small LED by the base of the toothbrush to let you know if it’s time to replace the brush head with a new one. It’s also rechargeable with 14-day battery life and comes with its very own travel case! The travel case can fit the electric toothbrush, extra brush heads and the charger with room to spare! The Philips Sonicare ProtectiveClean 5100 is admittedly quite similar to the DiamondClean and FlexCare+. And so what I liked about those two also rings true for this one. I like how it delivers that unbeatable 31,000 strokes per minute which cleans the heck out of my teeth, gums, and tongue. The QuadPacer and Smartimer are also great features for those who over-brush or under-brush any particular of their mouth. The BrushSync replacement reminder is simple yet very effective. While it is not as automated compared to the more premium feature of Oral-B products (The DiamonClean has Amazon Dash integration), it is more than enough to let you know that it’s time to replace the brush head. This product is that it only comes with one brush head. It may not be a big deal to some, but for me having an extra brush head in the packaging is always handy in case the one I have gets lost or damaged. While a lot of electric toothbrushes nowadays have tons of fancy features, some people prefer to go back to basics; just something to do the job without any of the fancy stuff. They just want a reliable electric toothbrush that does the job well. This is where the Oral-B White Pro 1000 comes in. At its core, it’s a very simple electric toothbrush. It only comes in one color, with one mode, and doesn’t have any of the other Oral-B features such as Positional Direction or SmartRing. But even though the White Pro 1000 may seem lackluster compared to its more feature-packed brethren, this electric toothbrush still carries the essentials to make sure your getting a great clean every time. It still has Oral-B’s replaceable brush heads, which means you can use a wide array of brush heads depending on your needs. It still has a two-minute timer which alerts you to when you ought to switch brushing to another area. It still has a pressure sensor to warn you if you’re applying excessive pressure. It still has an indicator by the base which alerts you if you need to recharge the battery. I recommend this toothbrush to anyone who wants a really effective yet barebones electric toothbrush. It has exactly one mode, Daily Clean, which is present in every single Oral-B electric toothbrush on the market. It has a two-minute timer, which can be considered an optional feature but is really useful when it comes to maintaining oral health and hygiene. And for those with sensitive gums or teeth, it still has a pressure sensor to ensure that you’re not brushing too hard. Honestly, while those high-tech feature-packed toothbrushes do excite me, a no-frills electric toothbrush of this quality is utterly charming in its simplicity. If you’re looking for something with a few more features, then I would recommend you look elsewhere (maybe take a look at Oral-B Genius Pro 8000). Also it’s worth keeping in mind that the lack of vibration settings other than Daily Clean might be an issue for people with sensitive gums and teeth. 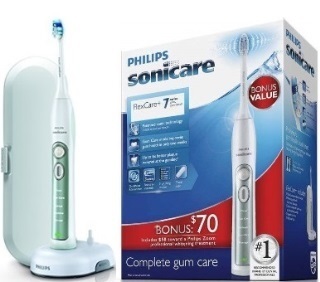 If Oral-B has the Oral 1000 as its ‘no-frills’ model, Philips has the Sonicare ProtectiveClean 4100 Plaque Control. It’s another electric toothbrush that’s just focused on making sure that your teeth, gums, and tongue are clean, the Sonicare ProtectiveClean 4100 is as basic as it gets, and that’s a good thing. While it might be a little on the basic ends of things, Philips Sonicare made sure that they didn’t compromise on the quality of its cleaning prowess. It still cleans your teeth at 31,000 brush strokes per minute. It still has a pressure sensor to make sure that you’re not damaging your teeth. It still has the QuadPacer and Smartimer. It still has BrushSync, which informs you if it’s time to replace the brush head. It also has an easy-start program which gradually ramps up the brushing strength over a 14 day period. These are perhaps the most essential features of any Sonicare toothbrush, and the ProtectiveClean 4100 still has them intact, it’s everything you need and nothing you don’t. The only feature it’s really missing that might affect your brushing routine is the multiple brush settings. The ProtectiveClean 4100 only has 1 mode, but if it’s the only one you actually use then this is the perfect toothbrush for you. I love a basic electric toothbrush. There’s a certain charm in having a gadget that simply does one thing and excels at it. I’m happy to say that the ProtectiveClean 4100 fits into this category. It’s a modest electric toothbrush that’s reasonably priced and can’t be faulted for being too expensive for the features that it offers. It also has a fairly long battery life at 14 days, which is a tad bit better than the usual 10-12 hours other toothbrushes have. As an added bonus, it comes in Black or White. At this price point, toothbrushes usually come in one color but having the additional option doesn’t hurt at all. If you have sensitive teeth, don’t get this. Get another toothbrush that has options to change the modes or intensity. The ProtectiveClean 4100 vibrates strongly, especially after the easy-start program. While you can reset the easy-start feature, it can be major inconvenience in the long run. 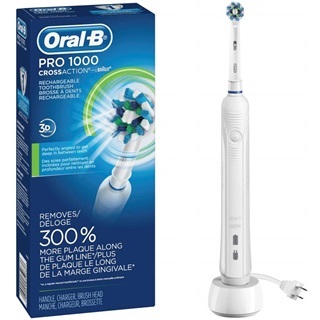 The Oral-B Pro 5000 sits somewhere between the Pro 1000 and the Pro 7500. While it’s not as basic as the Pro 1000, it’s also not as feature packed as the Pro 7500 although it does come close. With the Oral-B Pro 5000, this electric toothbrush comes with the usual features you’d expect from Oral-B. It has a 2-minute timer which lets you know if you should switch to another area in your mouth. It uses exchangeable brush heads so you can find the perfect brush heads for your needs. It has a visible pressure sensor which will alert you if you’re applying excessive pressure on your toothbrush. And it still has Bluetooth syncing with the free Oral-B app available on any smartphone. Compared to the Pro 7500, the Pro 5000 can only hold 11 days of charge as compared to the Pro 7500’s 14 days. It also lacks the customizable SmartRing and comes with a very basic case instead of a premium one. 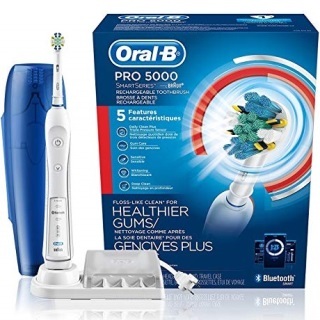 The Oral-B Pro 5000 is very similar to the Pro 7500 that I sometimes have a hard time recommending between the two. Most of the core features are shared between the two models and both do an excellent job in making sure that your oral health is in top shape. I would recommend the Pro 5000 for those who want a somewhat cheaper option compared to the Pro 7500. After all, unless you really need the additional 3 days of charge or the custom colors that the SmartRing provides, there’s really not much of a reason to go with the Pro 7500 compared to the Pro 5000. There are some reports that the battery life of the device greatly weakens after just half a year. I suggest that you only charge when necessary to avoid overcharging. A rotary toothbrush relies on the brush head to move in a certain motion or direction. This is where its name comes from, as the brush head usually spins around to rid your teeth of plaque. In most cases, the bristles of the brush head are arranged in such a way that it brushes away even the smallest amount of plaque. This is usually done by angling the bristles themselves and having different kinds and patterns of bristles. This way, the toothbrush can clean all the areas of your tooth and not miss a single spot. This important as even a tiny amount of plaque left after brushing can cause damage to the tooth and gums in the long run. But even in rotary toothbrushes, there are a lot of differences between toothbrushes as they may have different ways of “rotating”. Some types of electrical toothbrushes spin back and forth, while some only spin in one direction. There are other types of rotary toothbrushes that instead of rotating the bristles in a circular motion, move “layers” of bristles horizontally and vertically, each layer independent of each other. In contrast to the Rotary bristle movement, where the brush heads move really fast in a certain direction, sonic toothbrushes aid brushing your teeth by vibrating thousands of times per minute. By moving up to an incredible 40,000 pulses per minute, these sonic toothbrushes help clean your teeth by adding a “mini-stroke” in addition to the normal stroking gesture you do by brushing. This helps clean your teeth much much faster and more effectively. Sonic toothbrushes also generate enough force to shift the fluid dynamics of liquids around your teeth. This mechanism allows the toothbrush to clean places where the bristles may not physically reach. Instead, the toothbrush vibrates the liquids to act like the bristles to remove the plaque and bacteria in those hard to reach areas. So, is there one kind of electronic toothbrush that is better than the other? While both of them are more effective than regular, manual, toothbrushing, it will all come down to personal preference. Some people prefer the strong, pressurized feeling that rotary electronic toothbrushes provide. They feel much stronger as they act directly on the teeth and gums themselves. On the other hand, sonic toothbrushes pulse faster than rotary toothbrushes, but they actually feel less like they apply pressure due to the indirect cleaning through the use of fluid dynamics. 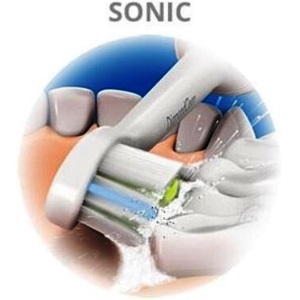 Some people may prefer the “gentler” feel of sonic toothbrushes since the vibrations are spread throughout the electric toothbrush’s body, unlike rotary toothbrush where the vibrations are more focused directly on the brush head. If you’re looking for research done on this area, there has been some research that state that a rotary toothbrush is more effective at removing plaque than a sonic toothbrush. However, a rotary toothbrush may cause discomfort to those with sensitive teeth or gums. There are hundreds different electric toothbrushes on the market right now, each with their own design and features. Of course, it would be near-impossible to have every single feature, but the brands try to include as much as they can in their models. Here’s a list of things you may want to consider when getting an electric toothbrush. This is the perhaps the most important feature you should be looking out for. Ergonomic design allows you to brush your teeth without straining your body (in this specific case, your arms). Make sure that the base of the body is neither too long or too short. Also, you may want to consider the weight of the toothbrush. If it is too light, you may need to grip it tighter once you activate the electronic mechanisms. If it is too heavy, it may strain your arm while brushing, especially with the added force of the motors when in use. Remember that a toothbrush is something that you use every day, so finding a good design that isn’t a pain to use should definitely be one of your concerns. When you’re constantly on the road, you’ll want an electronic toothbrush that you can rely on for the whole trip! For most people who brush their teeth in their homes, as long as the electronic toothbrush holds around 5-7 days’ worth of charge, then this area should be of little concern as you can just recharge it right after. However, those of us who’re a bit more nomadic might want something that lasts for up to 14 days before requiring a charge. This feature goes hand in hand with an extended battery life. Almost all electronic toothbrushes nowadays come with a charging base for the toothbrush. But some people may want toothbrushes that can be charged multiple ways. The classic USB port is everywhere and is used to charge most smartphones, and having an electronic toothbrush that charges via USB means that you can keep one less charger on you when you travel. There are also some toothbrushes that operate using an AA or AAA battery. For those who may not have the time to fully charge up their toothbrush, being able to swap out the batteries quickly and easily might be a very attractive prospect. While most people are good to go with the included bristles that come in the packaging of electronic toothbrushes, there are some who need gentler, softer bristles for their sensitive teeth and gums. In this case, finding an electric toothbrush with interchangeable brush head should be a top priority. Most brands list down if the electric toothbrush supports other kinds of brush heads. There are also some people who require specialized brush heads for teeth whitening and gum massaging, so this feature should also be on the top of their lists. When you brush your teeth, you use a good amount of water to clean the brush head and gargle and rinse your mouth. For the most part electronics and water do not mix, as this may cause a whole circuitry and system to fail. This is why electric toothbrushes are housed in sealed plastic shells so that water can’t easily enter the motor area of the brush. You’ll want to make sure that your electric toothbrush is sufficiently waterproof. Inspect the plastic body and see that it is fully sealed off. If there’s a screw that holds the cover of the battery, make sure it is tightly screwed in. If you think that the handle has a crack in it, discontinue using it as you may endanger yourself if water manages to seep into those cracks. Electronic toothbrushes have small motors within them, so strong forces may damage the motor and render the toothbrush unusable at all. If you’re always traveling, get an electric toothbrush that comes with a travel case. These are usually thick pouches that are designed to hold your electric toothbrush in place, and absorb external forces so that your toothbrush doesn’t get damaged. Another point to consider is the charger. Each country around the world uses a different voltage system. In the USA, most appliances and chargers run on 110 volts while Europe runs on 220 volts. Take a look at your charger to make sure you can use it in other countries. Using the wrong voltage on your charger can cause significant damage to your toothbrush, so when in doubt don’t be afraid to ask the manufacturer if you can use it in other countries. Having multiple brushing modes allows you to change the frequency and strength of the electric toothbrush based on your needs. Your everyday cleaning requires a different power setting compared to massaging your gums or whitening your teeth. Most electric toothbrushes have 3-4 brushing modes and power settings, but the higher end models have up to 7 settings with them (but they also require specialized brush heads in order to fully work). The ADA recommends that you brush your teeth twice a day, for at least two minutes. They recommend that you brush each quadrant of your teeth (upper right, upper left, lower left, and lower right) for at least 30 seconds at a time. A Quadpacer will tell you if it’s time to move from one quadrant to another while the Smarttimer will tell you if you’ve met the ADA recommended time of brushing your teeth of 2 minutes. According to Dr. Reisman and Dr. Contrucci, Brushing your teeth too hard may cause your teeth to be sensitive, cause your gums to recede and erode the enamel in your teeth. Having an electric toothbrush with a pressure sensor can prevent you from brushing too hard and damaging your teeth. The pressure sensor in these electric toothbrushes can either have a visual or audio indicator when it detects that too much pressure is being applied. Recent advancements in toothbrush technology have allowed some brands to track your brushing and give you feedback on your brushing habits through smartphone apps. By knowing where and how often you brush your teeth, these applications can suggest you tips so that you can follow the recommended guidelines set by experts when it comes to brushing your teeth. Alongside real-time feedback, these new electric toothbrushes can also determine through facial recognition if you’ve missed or overbrushed a quadrant of your mouth. By pairing your electric toothbrush and your smartphone’s camera, the brushing applications can tell you if you’re ready to move on to another area of your teeth. The 360-Degree smart ring can be seen in Oral-B electric toothbrushes. These strips of LED light up to let you know if you’ve applied too much pressure when you’re brushing your teeth. The glow of the light is quite noticeable, so you’re sure to know if you’re brushing your teeth the right way. Higher end models also allow these lights to be customized through the smartphone application. Another feature from Oral-B is the SmartGuide. This is a small LCD screen that appears like a standard electronic clock. However, once you turn on your toothbrush, the display changes into a timer and a visual guide which tells you where to brush your teeth and how long you should be brushing that area. Essentially, it is similar to the QuadPacer and the SmartTimer, but in a visual form which some customers may prefer. An un-cleaned tongue, even after brushing, can often be the cause of bad breath (halitosis). While there are individual tongue cleaners available out there, nothing is quite as effective as dedicated tongue cleaning brush heads, due to the additional cleaning power that electronic toothbrushes provide. Having an electric toothbrush, and one that has a brush head that can be replaced with a specialized tongue cleaner can drastically reduce or outright remove bad breath. An electric toothbrush that uses dual-frequency technology uses both sonic (which vibrate at around 24,000 to 48,000 pulses per minute) and ultrasonic (which moves at around 2.4 Million pulses per minute) to clean your teeth. 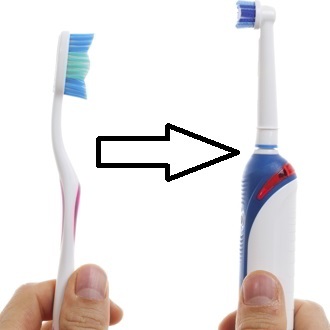 Since it vibrates at such a high rate, there’s no need to move your wrist and arm around as simply putting the toothbrush on top of your teeth is enough to work its wonders. Currently, there’s only one electric toothbrush out there that carries this technology: The Ultrasonic toothbrush by Smilex. Simply brushing your teeth with a plain old manual toothbrush already significantly increases your oral health as long as you follow the guidelines set by experts such as the ADA. However, recently, there have been studies that show that using electric toothbrushes are better in keeping your teeth clean and healthy. While it is true that electric toothbrushes cost more than manual toothbrushes, electric toothbrushes give its owner a lot of advantages over manual brushing. The most pronounced advantage is the built-in motor which aids in removing plaque and bacteria from your teeth. Whether you use a rotating/oscillating toothbrush or a sonic toothbrush, these are still better than a manual toothbrush when it comes to overall hygiene of your mouth. Additionally, features such as pressures sensors and real-time feedback give you immediate ways in improving your everyday brushing routine. There are a surprising amount of misconceptions about electric toothbrushes. A lot of these misconceptions stem from the initial wave of electric toothbrushes, which debuted almost a hundred years ago. I’ll clear up some of the more common ones. This is the number one greatest misconception about electric toothbrushes. While this may have been true in earlier versions of electric toothbrushes, technological advancements have made electric toothbrushes far better at cleaning and maintenance of oral hygiene compared to manual toothbrushes. A study by the Cochrane Collaboration has concluded that electric toothbrushes are up to 21% more effective in reducing plaque than manual toothbrushes. This misconception probably comes from the fact that earlier electric toothbrushes were often big and bulky with motors that made very uncomfortable sounds. Today, however, electric toothbrushes are safe for every day, regular use. With most electric toothbrushes having soft bristles and power settings for sensitive gums and teeth, there’s little to no damage that an electric toothbrush could do if used appropriately. In fact, they might even be safer as they require less pressure to use than to manual toothbrushes. While manual toothbrushes are indeed well-suited for those with impaired dexterity, or those with dental implants, it doesn’t mean that only those types of people should use electric toothbrushes. The Cochrane Collaboration report strengthens the fact that using an electric toothbrush is better in most cases, regardless of issues with mobility or any other impairment people may have. The most expensive electric toothbrushes do have a wide variety of features in them. Yet when it comes to the actual cleaning of gums and teeth, cheap electric toothbrushes do the job as well as their expensive counterparts. Most people actually continue using electric toothbrushes once they’ve tried it! A large scale study involving 16,000 participants stated that most people became satisfied with their toothbrush after their switch. Further research shows that more people regularly brush their teeth when they’ve moved to using an electric toothbrush, which is great for maintaining proper oral hygiene. Braun Oral-B is one of the two larger electric toothbrush brands. They are owned by Proctor and Gamble, an American multinational corporation. Their first toothbrush was made in 1950, known as the Oral-B 60. Today, Braun Oral-B has over 30 different kinds of toothbrushes, ranging from manual to fully automatic ones. The Oral-B Pro line of electronic toothbrushes is some of the most bought electric toothbrushes in stores. The other large electronic brand is Philips Sonicare. Originally created by the GEMTech corporation, Sonicare toothbrushes were popular ever since the 1990s. In 2000, Philips bought out the brand and, in 2003, rebranded the toothbrushes as Philips Sonicare. Unlike Oral-B, Philips Sonicare only markets electric toothbrushes. They carry over 30 different types of electric toothbrushes, from the premium DiamondClean line to the more budget oriented ProtectiveClean. Waterpik is a specialized brand that is well known for their home oral irrigators, also known as water flossers. VIO life another small brand that focuses on creating compact sonic toothbrushes which are perfect for traveling. They are most known for their Slim Sonics, which are only as tall as 3 AAA batteries stacked on top of each other. They also sell a line of electric toothbrushes called the Rockee which are sonic electric toothbrushes with a wide base so that kids can easier grasp them. Smilex is a specialized company that only produces one electric toothbrush: The Ultrasonic. This is the only electric toothbrush in the market to have dual frequency technology. It uses both sonic and ultrasonic vibrations to rid your teeth and gums of plaque and bacteria. Pursonic is a considerably newer brand compared to Oral-B or Sonicare. Launched only back in 2011, this brand has already become well-known thanks to the value in their products. While other competing brands only include 1-2 brush heads in the package, Pursonic includes up to 12 brush heads in their packaging. Another young brand that looks to upset the more established brands, Fairywill offers 11 different electric toothbrushes (at this time of writing) that are marketed at very competitive price points. Their toothbrushes use sonic technology. They also offer other oral hygiene products such as a water flosser and teeth whitening powder. 1. How worthy it is to invest in an electric toothbrush? Electric toothbrushes come in a lot of different packages and prices. According to studies, even a cheap electric toothbrush can substantially help you in reducing plaque in your teeth. I suggest that you buy an electric toothbrush which has the features that you need and one you can easily afford to replace. 2. Will the high vibration of electric toothbrush cause damage to gum line? No. In fact, The high vibrations are sometimes even sought after, as they can produce a massaging effect which can help in strengthening the gums. 3. Can I use an electric toothbrush if I’ve teeth sensitivity? Absolutely! Just make sure that the electric toothbrush you have has soft bristles or has a replaceable brush head that has options for sensitive gums and teeth. It’s also a bonus if the electric toothbrush has a sensitive function so that it can vibrate or oscillate at lower speeds. 4. Can I use an electric toothbrush with braces? Yes. They might even be better compared to manual brushing, as the micro brushing effect may be able to lodge particles in between your braces and your teeth. 5. Are electric toothbrushes safe for kids? Like any other electric device, an electric toothbrush is safe for kids as long as they are taught proper usage of it. You may also consider buying specialized electric toothbrushes for kids which usually have larger handles and smaller brush heads. If not, there are also smaller brush heads for those electric toothbrushes with replaceable brush heads. 6. “The higher the price, the better it results”? Not necessarily. Although there are some top-rated electric toothbrushes which are on the more expensive side, they do not necessarily clean better than their budget-oriented counterpart. What is important is whether or not the electric toothbrush has a sonic or rotary motor. While the search for the best electric toothbrush continues, this list should serve as a good starting point when considering which electric toothbrush to buy. The 10 listed here have my own personal seal of approval and should be on the forefront of your mind when considering to buy an electric toothbrush.